Keepmoat Stadium is a multi-purpose stadium in Doncaster, England, with a capacity of 15,231. It cost approximately £20 million to construct, as part of the wider complex it resides within which in total cost approximately £32 million, and is used by Doncaster Rovers, Doncaster Rugby League Club and Doncaster Rovers Belles Ladies Football Club. The first match at the stadium was a Rugby league match on 27 December 2006, when Sheffield Eagles beat Doncaster 16–10. 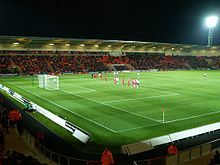 The official opening of the Keepmoat Stadium was on 3 August 2007, with Doncaster Rovers playing a Manchester United XI in front of a crowd of 13,080. United won the game 2–0. On 19 June 2012, it was confirmed that Doncaster Rovers had secured a 99-year operating lease from Doncaster Metropolitan Borough Council to lead the management of the stadium with a view to improving operating results across the stadium sports partnership. At the Stadium Business Awards 2010, the stadium received the award for Best Matchday Experience. The stadium itself is sponsored under a long-term contract by Keepmoat, a company specialising in council housing. They have the rights to the naming of the stadium. The East Stand is sponsored by Bartercard UK. The area of the East Stand towards the South East corner is the Families area sponsored by Doncaster Culture and Leisure Trust and is known as the "DCLT" Families Stand. This is the main match-day reception area with the stand sponsored by Estate.com. The South Stand, popularly known as the Black Bank, is sponsored by Polypipe. For Doncaster Rovers matches this is the stand that houses the Black Bank (the Ultras group of Doncaster Rovers supporters) and is decorated with flags and banners on match days, widely known for creating a fantastic atmosphere. The North Stand is sponsored by Corsan. The North Stand area closest to the East Stand is the usual location of visiting fans. Depending on the numbers of visitors, the availability of seats in this area are expanded westwards to meet demand. The all-seater stadium holds 15,231 spectators, 5,000 more than Belle Vue, with improved legroom and disabled access. Amongst the facilities in the new stadium is a new fans' bar, created to ensure fans have a place where they can enjoy pre-match drinks. The pitch itself incorporates a system of synthetic fibres interwoven with natural grass. This helps to maintain the pitch's integrity and prevents the playing surface from deteriorating throughout the course of the season. The pitch however does not have an under-soil heating system in-place, despite being a modern construction. This has resulted in the postponement of a match within the first year of full operation. A mini-stadium is situated beside the main stadium, featuring a six-lane running track and a 500-seat stand. The mini stadium is used by Doncaster Rovers Belles, Doncaster Rovers Reserves, Doncaster Athletics Club, Doncaster RLFC's academy team, and the Doncaster Mustangs American football team. Stadium during a football match. The first game played by Doncaster Rovers in the new stadium was on 1 January 2007 against Huddersfield Town, whom they beat 3–0. The game also saw the first three red cards in the new stadium. Doncaster Rovers' centre forward Mark McCammon was the first player ever to score on the new pitch. Doncaster's first loss at the stadium came five days later at the hands of Bolton Wanderers when they defeated the Rovers 4–0 in the 3rd Round of the FA Cup. On 14 January 2007, Doncaster Rovers Belles' first match in the main stadium resulted in a 5–2 defeat to Leeds United, before a crowd of 1,797. Vicky Exley was the first Belle to score on the new pitch. The stadium hosted the final of the 2012–13 FA Women's Cup. The highest ever attendance at the Keepmoat stadium was 15,001 for the visit of Leeds United. Rovers also achieved attendances of over 14,800 at the Keepmoat Stadium in games against Sheffield Wednesday and Newcastle United. On 3 March 2010, it hosted England’s under-21s 2011 UEFA European Under-21 Championship qualification Group 9 match against Greece’s under-21s. The hosts lost 2–1 with the visitors goals coming from Kyriakos Papadopoulos on the 28th minute and Yiannis Papadopoulos on the 49th minute while Nathan Delfouneso scored for the hosts on the 80th minute. The opening game played by Doncaster in the new stadium was against Sheffield Eagles, to whom they lost 16–10 in front of 5,400 spectators. Sheffield Eagles (and former Dons') Richard Newlove was the first player to score try at the new stadium. On Sunday 27 July 2008, the stadium hosted a semi-final of the Rugby League Challenge Cup between Hull F.C. and Wakefield Trinity. Hull beat Trinity 32–24 in front of a crowd of 14,716. The stadium hosted the opening match of the 2009 Gillette 4 Nations on Friday 23 October between co-hosts England and France attracting a crowd of 11,529. The stadium hosted the semi-final of the Rugby League Challenge Cup between Castleford and Leeds on Sunday 7 August 2011, Leeds winning 10-8 in front of 13,158 fans; another Challenge Cup Semi-Final between Hull FC and Wigan took place at the stadium on 29 July 2016, Hull running out 16-12 winners. The Dons local rivals, Sheffield Eagles, used the stadium as their temporary home during the 2015 rugby league season. There have also been a variety of other events held in the Keepmoat Stadium, including two concerts in July 2007 featuring Ronan Keating, Bryan Adams and McFly. In July 2008 there was also a show by Sir Elton John and his band. In September 2008, the stadium was used to host the BAFL (British American Football League) finals known as "Britbowl". In mid June 2009 opened its facilities to accommodate corporate events and private functions, the first of which being the marriage reception of Wesley and Claire Vaughan, June 2009. In November 2010, darts superstar Dennis Priestley held a darts exhibition at the Keepmoat Stadium. On 30 July 2011, Irish vocal pop band Westlife held a concert for Gravity Tour supporting their album Gravity. On 11 May 2013, an IBF Bantamweight World Title boxing match between Jamie McDonnell and Julio Ceja took place at the Keepmoat Stadium, with McDonnell the winner. On 28 April 2016 it was announced that Rugby Union team Doncaster Knights would use the Keepmoat for a maximum of six games next season if they are to win promotion to the Aviva Premiership. This would allow work to be undertaken on their home ground of Castle Park in order to bring it up to at least the minimum seating capacity of 10,000 required by the RFU and the Professional Game Board (PGB) for a premiership venue.. However, the Doncaster Knights did not obtain promotion that season. Belle Vue, Doncaster Rovers' former home. ^ ""Keepmoat Stadium" new name for centre-piece of £32million Lakeside Sports Complex". Stadium Management Company, Doncaster. 20 November 2006. Archived from the original on 8 October 2007. Retrieved 28 August 2007. ^ "A taste of things to come". Doncaster Today. 9 August 2007. Retrieved 28 August 2007. ^ "Rovers welcome Keepmoat lease". Yorkshire Post. 19 June 2012. Retrieved 16 July 2012. ^ "Doncaster announce stadium name". BBC South Yorkshire. 21 November 2006. Retrieved 17 April 2007. ^ "Doncaster Rovers – Keepmoat Stadium". Yorkshire Evening Post. 27 June 2007. Archived from the original on 28 September 2007. Retrieved 9 August 2015. ^ "Doncaster Rovers". National Association of Disabled Supporters. Retrieved 28 August 2007. ^ "Feature: Media Information Architecture Week Yorkshire". Architecture Week. Retrieved 28 August 2007. ^ a b "United 'left in the dark' by Rovers". Yorkshire Evening Post. 16 February 2008. Retrieved 17 February 2008. ^ "First day at Keepmoat". BBC South Yorkshire. Retrieved 28 August 2007. ^ "Doncaster vs Huddersfield". Huddersfield Town Official Website. 1 January 2007. Archived from the original on 14 February 2008. Retrieved 28 August 2007. ^ "Doncaster Rovers Match Report – Doncaster Rovers 0 – Bolton Wanderers 4". Doncaster Rovers Official Website. 6 January 2007. Archived from the original on 15 June 2011. Retrieved 10 July 2009. ^ Tony Leighton (15 January 2007). "Belles ring changes at new home". The Guardian. Retrieved 15 November 2010. ^ Tony Leighton (14 January 2007). "Leeds deny Donny on stadium debut". BBC Sport. Retrieved 2 August 2011. ^ "FA Women's Cup final: Arsenal Ladies beat Bristol Academy". BBC Sport. BBC. 26 May 2013. Retrieved 19 May 2014. ^ "Doncaster Vs Leeds united". Doncaster Rovers Official Website. 1 April 2008. Archived from the original on 15 June 2011. ^ "Eagles spoil Dons' opener at Keepmoat". Doncaster Today. 28 December 2006. Archived from the original on 29 September 2007. Retrieved 28 August 2007. ^ Hoden, Liam. "Doncaster Knights to ground share with Rovers if they win promotion to the Premiership". The Star. Johnston Publishing Ltd. Retrieved 28 April 2016. Wikimedia Commons has media related to Keepmoat Stadium.